The Men Who Stare at Goats is a 2009 British-American satirical war film directed by Grant Heslov and starring George Clooney, Ewan McGregor, Jeff Bridges, and Kevin Spacey. It was produced by Clooney's and Heslov's production company Smoke House Pictures. The film is a fictionalized version of Jon Ronson's 2004 book of the same title of an investigation into attempts by the U.S. military to employ psychic powers as a weapon. The film premiered at the 66th Venice International Film Festival on September 8, 2009, and went on general release in the United States, the United Kingdom, Canada, Ireland, and Italy on November 6, 2009. In a short prelude, U.S. Army General Hopgood is painfully thwarted in an attempt to pass paranormally through a solid wall by simply running into it. The film then follows Ann Arbor Daily Telegram reporter Bob Wilton, whose wife leaves him for the newspaper's editor. Seeking an escape, Bob flies to Kuwait to report on the Iraq War and to prove to his wife and himself that he is a man. However, he stumbles onto the story of a lifetime when he meets a retired U.S. Army Special Forces operator, Lyn Cassady, who reveals that he was part of a U.S. Army unit training psychic spies (or "Jedi Warriors") to develop a range of parapsychological skills including invisibility, remote viewing, and phasing. The back story is told mainly through flashbacks. In 1972, Army officer Bill Django, after accidentally falling out of a "Huey" helicopter in Vietnam's Bình Dương Province, found his newly recruited men to be unable or unwilling to fire on a female Viet Cong soldier before she shot him in the chest. He then underwent a fact-finding mission prompted by a vision where the Viet Cong soldier says "their gentleness is their strength." The bulk of Django's mission immersed him fully into the New Age movement so that, when he returned to Fort Bragg, North Carolina, in 1980, he had long braided hair and a tattoo of an All-seeing Eye surmounted on a pyramid on his chest. Facilitated by the credulous General Hopgood, Django led the training of a New Earth Army, with Lyn Cassady and Larry Hooper as his top students. The two quickly developed a lifelong rivalry because of their opposing views on implementing the New Earth Army's philosophy. Lyn wanted to emphasize the teachings' positive side, such as the ability to resolve conflict peacefully, whereas Larry was more interested in the "dark side" and its military applications. Prompted by a doodle in Bob's notebook (of an eye on a pyramid), Lyn takes him into Iraq. They are kidnapped by criminals who want to sell them to insurgents but escape with fellow hostage Mahmud Daash. They are rescued by a private security detail led by Todd Nixon. The trio flees when the detail is caught in a firefight fiasco with another American security detail. Bob and Lyn then continue on Lyn's alleged "mission", stating he had seen a vision of Bill Django. After taking the wrong fork in the road their car is disabled by an IED. The other fork in the road actually leads to al-Qaim, Lyn's destination, but neither of them was able to read the Arabic on the roadsigns. Bob and Lyn wander in the desert where Lyn reveals that he had stopped a goat's heart to test the limit of his mental abilities and believes this evil deed has cursed him and the rest of the New Earth Army. It's also revealed that Hooper conducted an unauthorized LSD experiment which resulted in a soldier killing himself, and therefore forced Django out of the Army. Eventually, Bob and Lyn are rescued and rehabilitated at a camp run by PSIC, a private research firm engaged in psychic and psychological experiments on a herd of goats and some captured locals. To Lyn's dismay, Larry runs the firm and employs Django, now a depressed alcoholic. Bob spends time with Django and learns the ways of the New Earth Army. They spike the base's food and water with LSD and free both the goats and captured locals, in an attempt to remove the curse. Following this, Lyn and Django fly off in a helicopter, never to be heard from again, disappearing into the sky "like all shamans". Bob returns to work as a reporter and writes an article about his entire experience with Lyn. However, he's frustrated in that the story's only portion to be aired on the news is how the captives were forced to listen to the Barney & Friends theme song for 24 hours. This dilutes his story to the level of a joke, and Bob vows to continue trying to get the bigger story out. In the film's final scene, Bob exercises his own psychic abilities and, following some intense concentration, stands up and runs headlong through a solid wall in his office. George Clooney as "Lyn Cassady" is a combination of several real-life psychic spies. Elements of his character are primarily based on Glenn Wheaton and his name resembles that of Lyn Buchanan. His background details match those of Guy Savelli, the man who claims to have killed a goat by staring it down and now runs a dance studio as Lyn does in the film. Also, some of Lyn's actions in the film mimic Peter Brusso's interactions with Ronson, particularly the "Predator" scene, and the "attack me" scene. Ewan McGregor as "Bob Wilton", apparently inspired by Ronson, a mild-mannered investigative journalist who uncovers the bizarre truth. Jeff Bridges as "Bill Django", based on Lt. Col. Jim Channon who spent two years in the 1970s investigating new age movements, and subsequently wrote an operations manual for a First Earth Battalion. Kevin Spacey as "Larry Hooper". An apparent original creation for the film, Larry represents the New Earth Army's dark side and wishes to use the non-lethal technologies in harmful ways and is the film's main antagonist. Stephen Lang as "General Hopgood", who is based on Major General Albert Stubblebine III, and firmly believes people can walk through walls. Robert Patrick as "Todd Nixon", an original character heading up a private security firm in post-invasion Iraq. Waleed Zuaiter as "Mahmud Dash", an Iraqi who gets captured with Cassady and Wilton. Stephen Root as "Gus Lacey", who introduces Bob to the New Earth Army's concepts; also somewhat based on Guy Savelli and Lyn Buchanan. Glenn Morshower as "Major Jim Holtz", a more by-the-book soldier. Although this film is inspired by John [sic] Ronson's book The Men Who Stare At Goats, it is fiction, and while the characters Lynn [sic] Cassady and Bill Django are based on actual persons, Sergeant Glenn Wheaton and Colonel [sic] Jim Channon, all other characters are invented or are composites, and not portrayals of actual persons. The filmmakers ask that no one attempt walking through walls, cloudbursting while driving, or staring for hours at goats with the intent of harming them...invisibility is fine. The film received mixed reviews from film critics. Review website Rotten Tomatoes reports that 51% of 210 critics have given the film a positive review, with an average rating of 5.7 out of 10. The website's critical consensus is that "Though The Men Who Stare at Goats is a mostly entertaining, farcical glimpse of men at war, some may find its satire and dark humor less than edgy." Metacritic, which assigns a weighted average rating to reviews from film critics, has a rating score of 54 out of 100 based on 33 reviews. George Clooney's performance was very positively received. Mike Sheridan of entertainment.ie wrote, "Clooney shines in this remarkable story, based on actual events...Clooney is now pretty much the sole bearer of the 'classic movie star' tag, and once again, he injects a performance with a Coen brothers level of quirky. His twitches, his more ponderous moments; you buy this character because it's Clooney, and he's exceptional here." The film is inspired by British journalist Jon Ronson's book, which was accompanied by the 2004 Channel 4 three-part documentary Crazy Rulers of the World. In turn, Ronson had dedicated his book to journalist and filmmaker John Sergeant, who worked intensely through 2003 and 2004 on the documentary. However, Sergeant has complained he has not received any credit for his part in formulating what was the inspiration for the film. Sergeant's version of events is corroborated by a number of sources: the book The Men Who Stare at Goats itself is dedicated to Sergeant, and the afterword states: "John's research and guidance can be found on every page". Further, Colonel John Alexander – one of the story's leaders – has written to Sergeant: "If you want support for your position, tell reporters (or lawyers) to contact me. You were definitely the key person in developing the whole Goats project." 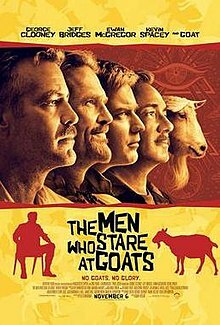 The Men Who Stare at Goats was released on DVD and Blu-ray Disc in Region 1 on March 23, 2010, and was released in Region 2 on April 19, 2010. The extras include "Goats Declassified: The Real Men of the First Earth Battalion". ^ Fritz, Ben (5 November 2009). "Movie projector: Holiday season kicks off with Disney's pricey 'Christmas Carol'". Los Angeles Times. ^ "Movie The Men Who Stare at Goats – Box Office Data". The Numbers. Retrieved 2011-06-03. ^ Steven Zeitchik (18 May 2009). "Overture to get Clooney's 'Goats'". Hollywood Reporter. Retrieved 22 June 2009. ^ a b Sergeant, John (November 18, 2009). "How My Involvement with The Men Who Stare at Goats Was Erased Entirely". Huffington Post. Retrieved 2010-01-30. ^ "Gorgeous George Stares At Goats: Clooney becomes a psychic soldier". Empire. 16 May 2008. ^ a b c "McGregor, Spacey, Bridges Stare At Goats". Empire. 12 September 2008. ^ "Rebecca Mader joins 'Goats' herd". The Hollywood Reporter. Archived from the original on October 13, 2008. ^ "The Men Who Stare at Goats (2009)". Rotten Tomatoes. Fandango Media. Retrieved June 21, 2018. ^ "The Men Who Stare at Goats Reviews". Metacritic. CBS Interactive. Retrieved 10 April 2018. ^ Sheridan, Mike (23 October 2009). "The Men Who Stare At Goats Review". entertainment.ie. Entertainment Media Networks. Retrieved 10 April 2018. ^ Akbar, Arifa (3 November 2009). "Clooney caught in crossfire as war breaks out over latest film". The Independent. London. Retrieved 2010-01-30. ^ Sergeant, John (18 November 2009). "How My Involvement with The Men Who Stare at Goats Was Erased Entirely". Huffington Post. HuffPost News. Retrieved 2 November 2011. Wikimedia Commons has media related to The Men Who Stare at Goats. This page was last edited on 7 February 2019, at 12:58 (UTC).